So I’m a little behind on blogging. I’m also lazy. And it’s summer (well supposedly). Really I just haven’t felt like it. Plus Ragnar didn’t quite go as I had planned (more on that later). 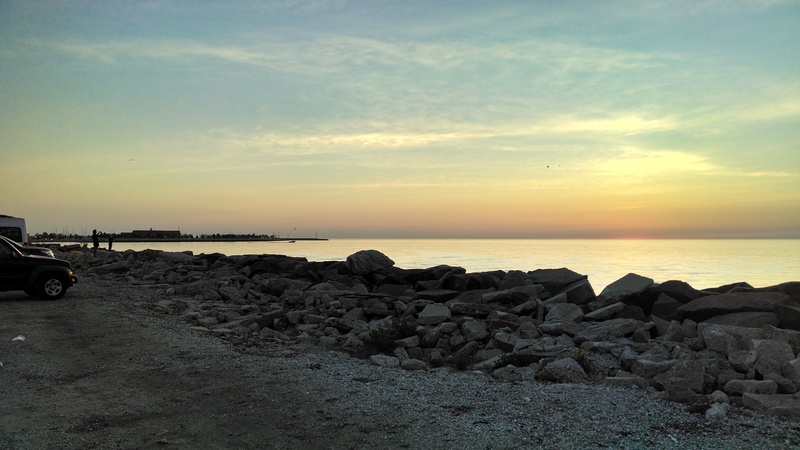 The Thursday night before Van 1 all gathered in Milwaukee and started our trek to Madison. We had a nice little surprise when checking in at the hotel. The “suites” I thought I had reserved turned out to not be suites. 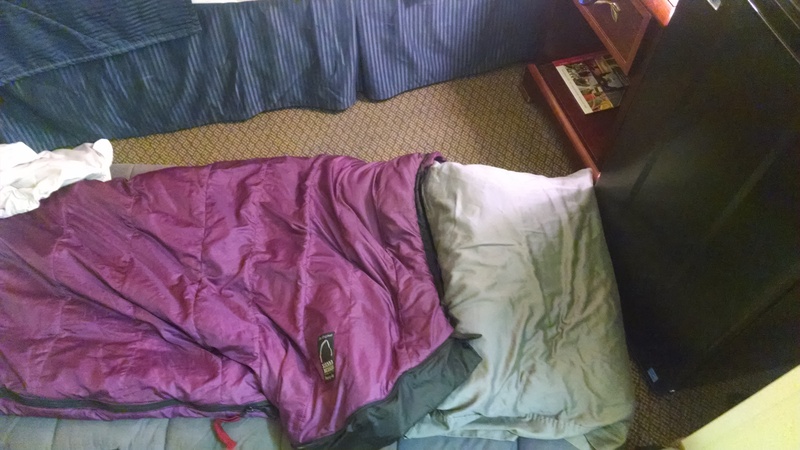 I volunteered to sleep on the floor. I called it urban camping. 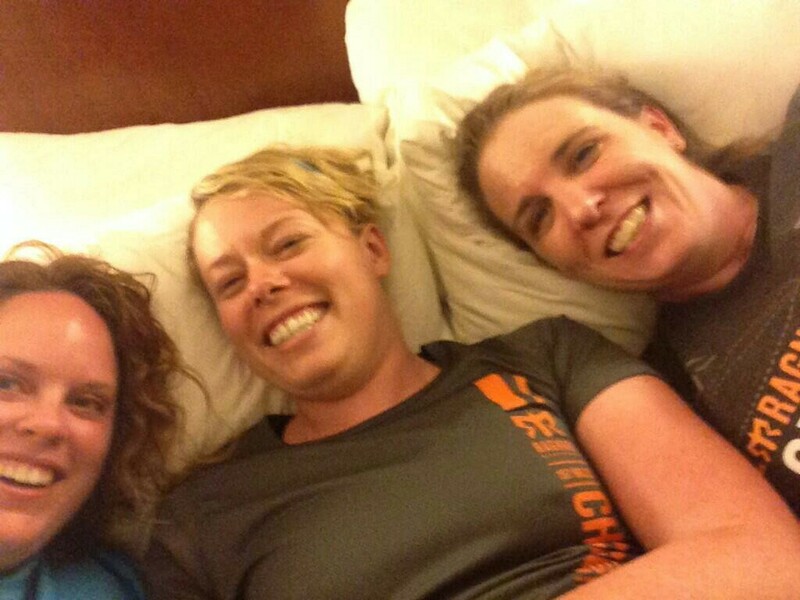 After giggling like morons as we do, we went to bed. And what felt like moments later, Jen, Erica and I got up stupid early to meet the rest of Van 1 and head to the start. I’m pretty sure Erica said “Running is stupid” as her first sentence of the morning. I expect nothing less. 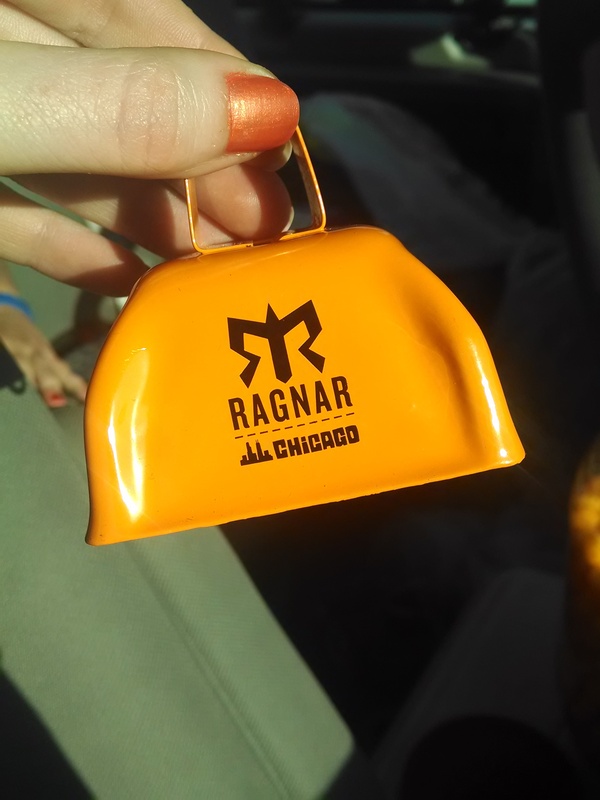 We went to the start line and had to listen to the dumbest, most annoying safety talk I’ve ever had to listen to at Ragnar. As in we actually complained about it. Before we knew it Erica was off and running. I was runner six this time so had a lot of time to eat gummy bears, help navigate and wait around. I could tell it was getting hotter and started getting whiny. I also knew this meant I would be slower. Stupid heat (and undertraining). I made sure I was hydrated, covered in sunscreen and not super excited about 9.6 miles in the middle of the day in direct sun. The first several miles were on the road and in the sun. I saw three dead turtles in the first three miles. 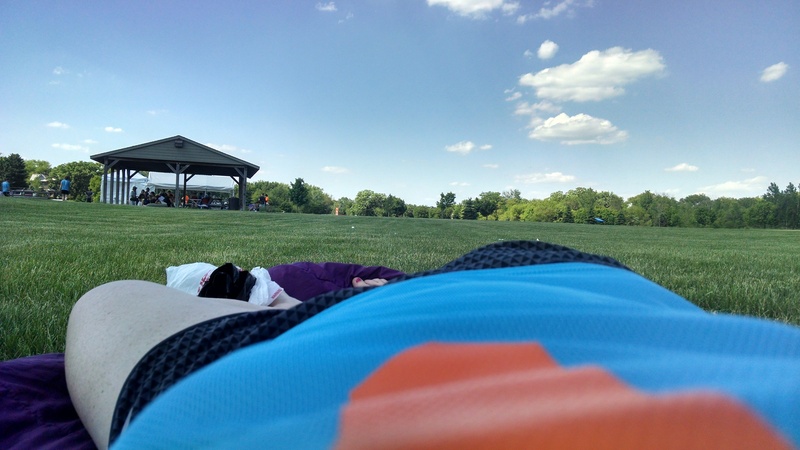 At about mile 4 we turned onto the Glacial Drumlin Trail and I stupidly thought the shade would last. I had shade for about half a mile. When there was intermittent shade and a little breeze it actually felt good out there, otherwise it was miserable. I pushed myself to the finish, ignore the pebble in my shoe for the last half mile and happily handed off to Van 2. Smiling, because I’m almost done, not because I feel good. I quickly said hi to van 2 people and then realized my foot felt funny. I thought it was the pebble in my shoe so I just took my shoe off. It was then I realized my foot hurt and not my usual PF pain. I kind of limped to the van, shoeless, because there was no way I was putting my shoes back on at that point. I really didn’t think too much of my foot at this point. I just wanted nuun and to sit down. Since I was runner 6 we were off duty at this point and heading straight to Water Street Brewery in Delafield. When we got there I realized I could barely put weight on my left foot. I hobbled into the restaurant and immediately called my dad. I knew the pain wasn’t normal. As soon as I told him what was going on my heart dropped. He thought it could be broken. After lunch we set up camp (a shade tent) at Wales Park and I iced my foot with hopes that it would miraculously not be in pain any more. I rested for quite awhile and then had to hobble across the park to use the bathroom. My foot definitely still hurt so I continued to ice it. I called my dad again and we discussed it. He ended my Ragnar then and there. The positive was I had already run over half my miles and my team was totally awesome about breaking up the rest of my runs. I almost cried once, but held it together and decided to still enjoy the rest of it. I ended up doing a lot of navigating and some driving to give Aaron a reprieve. Erica took my second leg, three miles in her old neighborhood and then we passed off to Van 2 again. It was almost bed naptime. We got up after something like three hours of sleep, which was awesome. I slept pretty well. No random person tried to wake me up this year so that was a plus. I was still a little sad to not be running, but was very much looking forward to breakfast after Van 1 was done. By everyone’s third leg people are just tired. We wanted to get our runners done before it got too hot and my teammates were running extra miles since I couldn’t run. We made it to Exchange 30 and passed off to Van 2 with breakfast in our sites. After a wonderful breakfast we found our way to the parking lot that had buses to the finish (I still don’t like this). We got our free beers and some pizza and settled in on a blanket before the rest of the team got there. 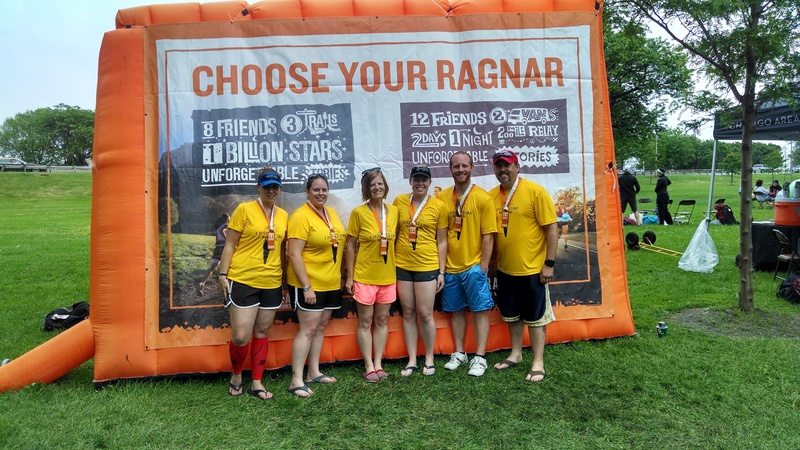 We had time to do a little Ragnar shopping and drink some more beers that we brought. I found Mo finally and then Van 2 got there. Anne came flying in and we gathered together to run to the finish. 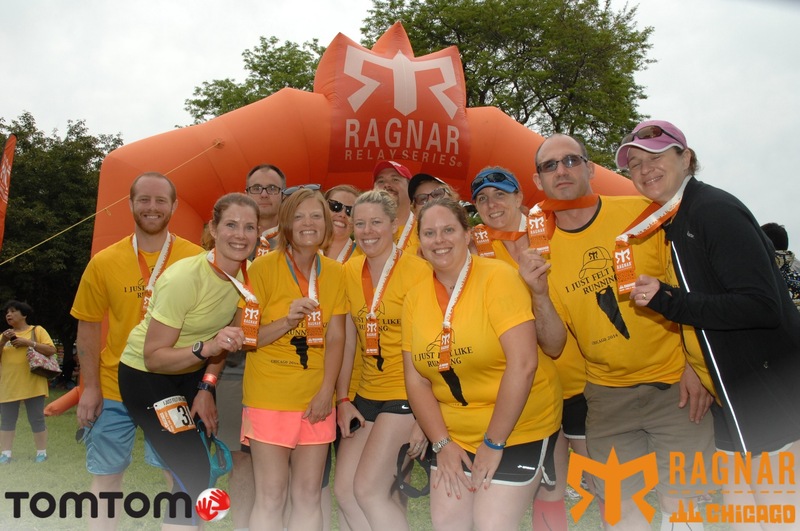 Ragnar number 4 was done. And then we had the absolute worst part of Ragnar: The Drive Home. We got back to Milwaukee around 8:00pm on Saturday, unpacked the van and that was it. I showered, started laundry and went to bed. I think I slept 13 hours. Foot Update: it was not broken and actually started feeling a bit better by Sunday. 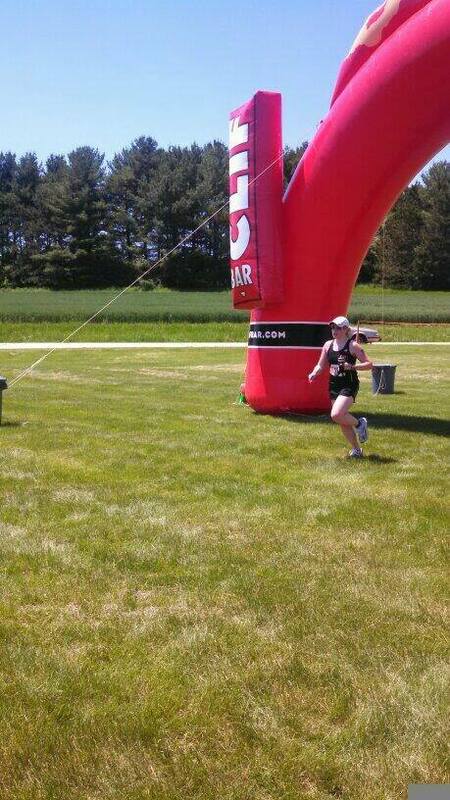 I’m glad I didn’t run on it, but sad I only ran part of Ragnar. I guess I just have to go back for 2015.